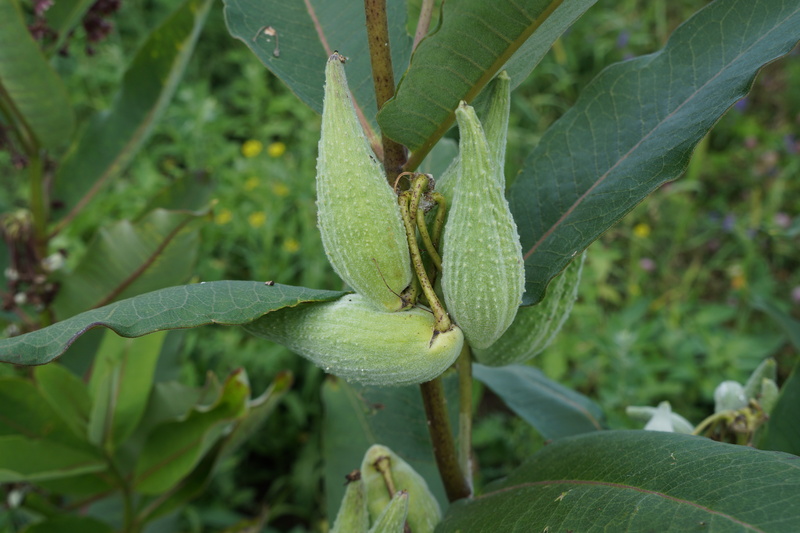 There are few plants that offer the variety and flavour you find in milkweed – the shoots, leaves, flowers and seed pods. The problem is that all these parts have to be harvested at just the right moment, so if you dally you have to wait for the next season to be able to try out the recipes you thought up during the winter. The pods are just beginning to appear now, and although they won’t last long you will still have time to pick them if you live at this latitude or further north. I have already covered the identification of these beautiful plants in recent posts on leaves and flowers, so I will go straight to the topic of this post – the seed pods. These appear just after the flowers wilt, and grow out of each little floret which is why you find them in tight bunches. They don’t all mature at the same time, so you will find several pods of different sizes all snuggled up together. If you just select the pod that is the right size – not too big, not too small, you will still leave enough for the plant to reproduce and keep your garden/field with a healthy crop next year. Now, a little more about the size. I tried cooking them last year and found that some of the pods were a little post mature so I wasn’t able to write about it. This time, I actually measured the pods, because my impression of ‘under two inches’ was a little off. The recommended size is between 1 inch and 1 3/4 – above that you risk having a tough, wooly pod which is not pleasant at all. In fact, after last year’s attempt I know it is inedible. But the younger pods have a sweet flavour and can be used in all sorts of recipes. If I had to compare it to any vegetable, I would say it is most like okra, but without the slimy texture. They have enough substance to hold their own mixed with other vegetables, and like okra go very well with spicy sauces. 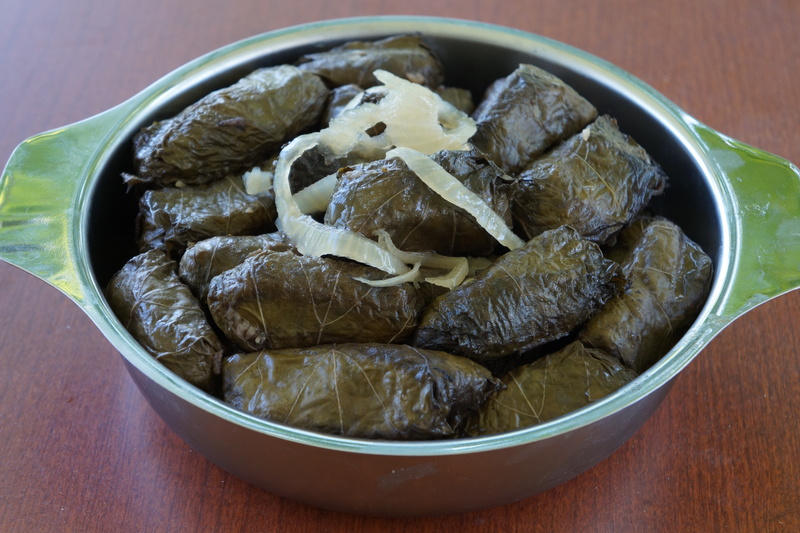 The most common method is to boil them in water and then cook them again as you like, stewed, fried, baked etc. Many recipes call for a change of water and two or three boilings, but with the young pods this is not really necessary as long as they get cooked. In this recipe, they are simply baked in the oven with a crispy batter and then baked a little longer with the sauce on it. 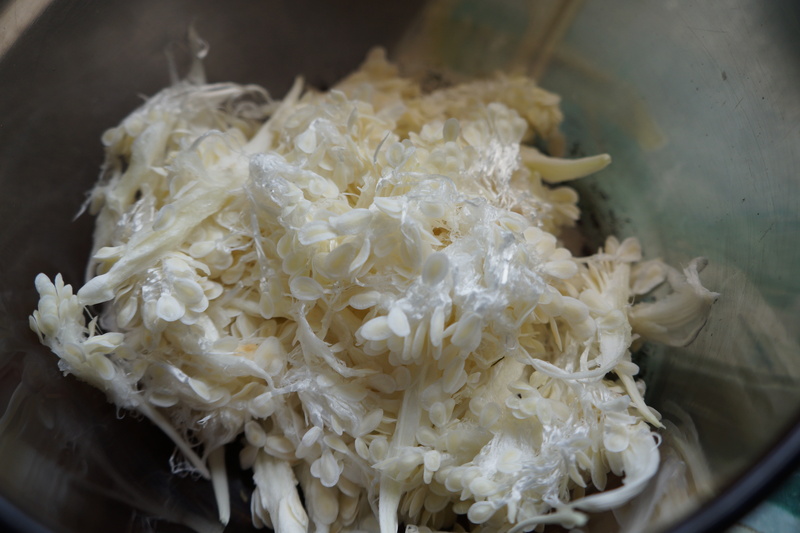 I also used what is referred to as the silk, which is the white fluff inside. If you pick only these small pods (you might want to measure them) the silk will be moist and pure white. There are fine white seeds on one side, but they too are very fine and sweet tasting. It was near impossible to separate the seeds from the threads, so I assumed I should use the whole clump. I saw many references to using this silk instead of cheese, but only by trying it myself did I understand how this works. I hope my experiments save you some time in knowing how to select them and what to expect from them. 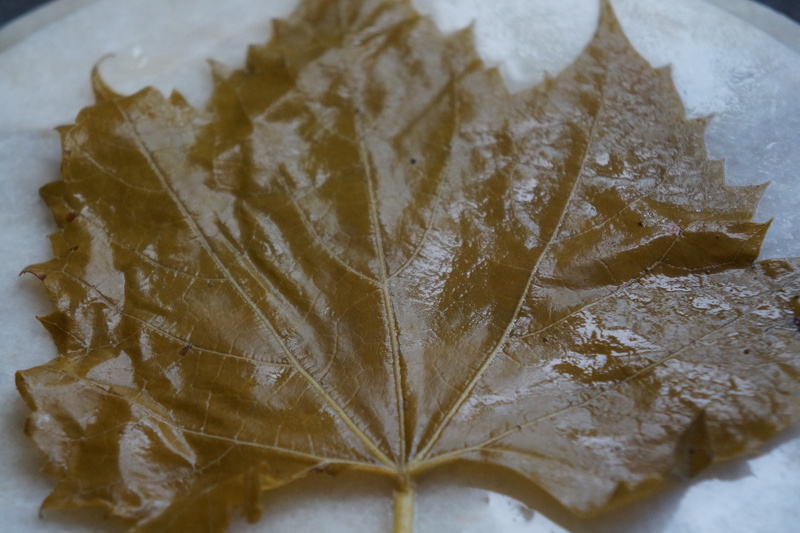 The first recipe which you can use directly is from Edible Wild Food. I have written my version of it out with a few of my own changes. I made my version vegan, but if you don’t mind some animal product in it you can use an egg instead of the chia seeds and regular milk instead of the almond milk. Mix the dry ingredients together. Soak the chia seeds in the milk for ten minutes. Mix everything together and add enough water to make a thick batter for coating. Coat each pod in the batter and place in an oven proof dish or on a lined cookie tin. I used corn husks to line mine. Bake in a 350 oven for about half an hour until the pods are crisp and dry. Remove from the oven and pour the hot sauce over them. Return to the oven for another 20 minutes. As I had picked some a little larger than the prescribed size, but still very young, I used these to make the ‘cheese’ Since I had to open each pod, I was able to inspect it and make sure it was not dry or turning brown. To open the pods, there is a barely visible seam on the flat side which opens easily enough just by using your thumb. Slit it open this way and pull out the silk insides. I wasn’t sure what to do with it, but I loosened it up a bit and put it in a bowl. This is supposed to work as a mozzarella type cheese, but I wasn’t sure if it needed pre-cooking. So I made two pizzas – one with ‘cheese’ just dotted on top, and one with ‘cheese’ which I cooked in a smidge of water for a few minutes. There was no difference, but I think the cooked silk could probably be frozen and saved for later use. The result of this vegan cheese was very pleasant, a bit stringy like mozzarella and sweet. It goes well with any spicy or salty toppings. I won’t give a pizza recipe, just to say that you can use this instead of or along with cheese in your favourite pizza recipe. For my pizza, I made a plain crust with about 1 Tbsp of bullrush flour (the sum total of my harvest for this year). I then covered it with a cheeseless, dandelion and walnut pesto, roasted tomatoes and capers, which were actually fermented milkweed flowers which went very nicely. Drizzle it with a little olive oil before serving. I still have a few pods left which I will try and preserve for further recipes, as now that I have started I am getting more ideas of what can be done with them. And I really don’t want to have to wait a whole year in order to try them out. 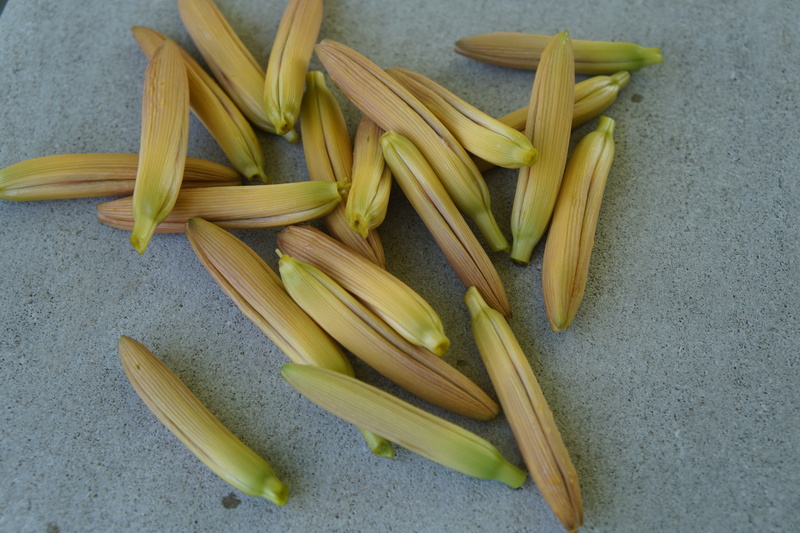 Earlier in the year, I started experimenting with the prolific wild day lily (hemerocallis fulva), using at that time the tubers and the shoots which I described in this post. Now they are in full flower, but before I use the-full blown flowers, I decided to prepare something with the unopened blossoms. Coincidentally I received a post today on this very plant from Edible Wild Food – a site I often use to help me identify unfamiliar weeds and such – which gives a good description of what is called around here the ‘ditch lily’. If you’re not sure what this plant is or want to learn more about it, I recommend this post. If you have any gardening questions of the wild kind, this is a great source. 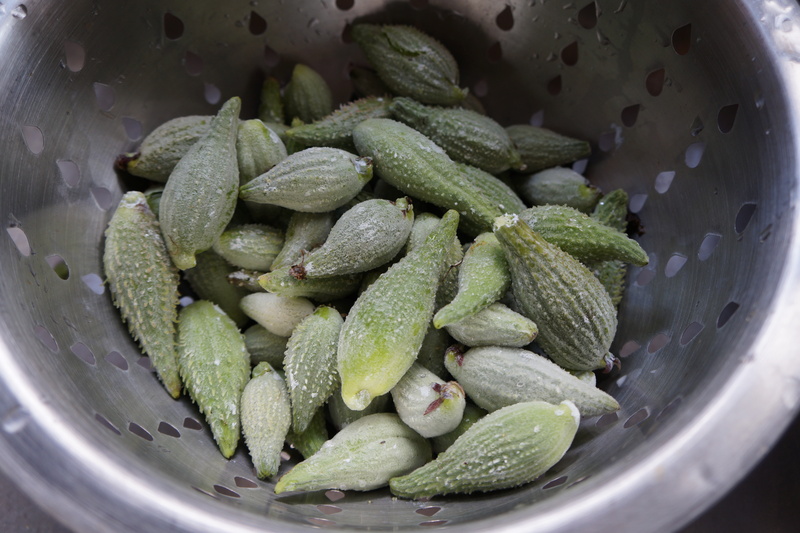 My recipe is not really a recipe – just an illustration that these pods can be eaten and are very tasty. The last few days I have been cooking, but not so much my own recipes as several of the super dishes presented at last week’s Fiesta Friday #24, so all I have to bring this week to Fiesta Friday #25 is this simple but delicious dish of vegetables with lily buds. I will be co-hosting again this week, this time with my fellow-Canadian Chef Julianna from Foodie on Board. It should be noted that some people (some sources say 2%, others 5%) suffer digestive upsets from this plant, so go easy at first if you haven’t tried them before just to be on the safe side as with any new food. 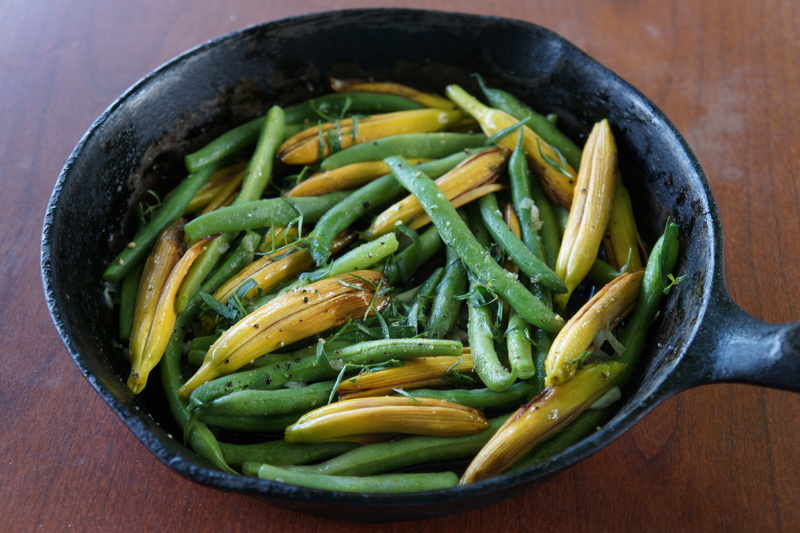 To prepare them as a side dish, I lightly fried some green beans in a mixture of olive oil and butter, added chopped garlic, herbs (in this case fresh tarragon) and seasoning. Then I added the lily buds and fried just a minute or two longer until they looked slightly toasted. The flavour is sweet, a little fruity and not at all bitter or sour. 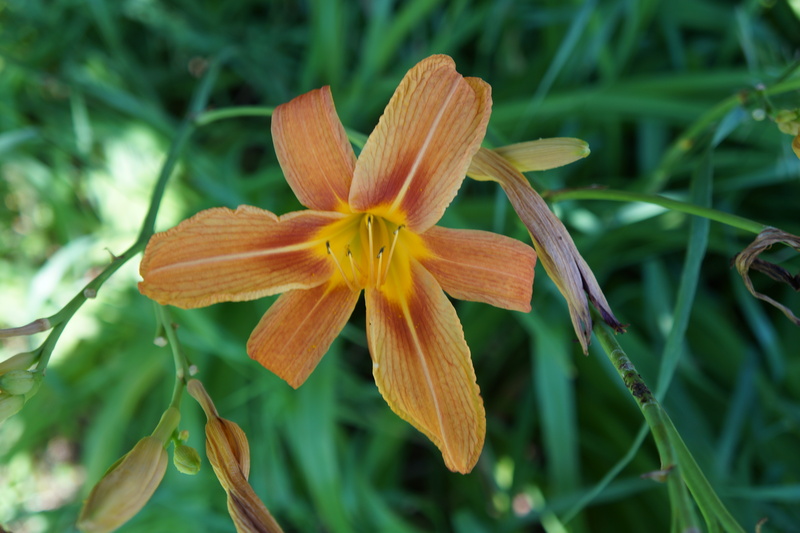 If you haven’t tried cooking with wild flowers before, hemerocallis fulva is a great one to start with. And to all the guests at this week’s fiesta, a big welcome. I look forward to seeing what treats are in store for us this time. If you would like to join in the fun, check out how and where here. Categories: edible weeds | Tags: ditch lilies, Fiesta Friday, foraging, hemerocallis fulva, side dish, vegetable dish | Permalink. This is the first time I have ever reblogged someone else’s post. I loved the way the plantain is used as a skin tonic and thought some of my readers might be interested. I also like the pictures here so decided I would just pass it on as is. I usually try to make original recipes, but occasionally I come across something I haven’t thought of and want to try. 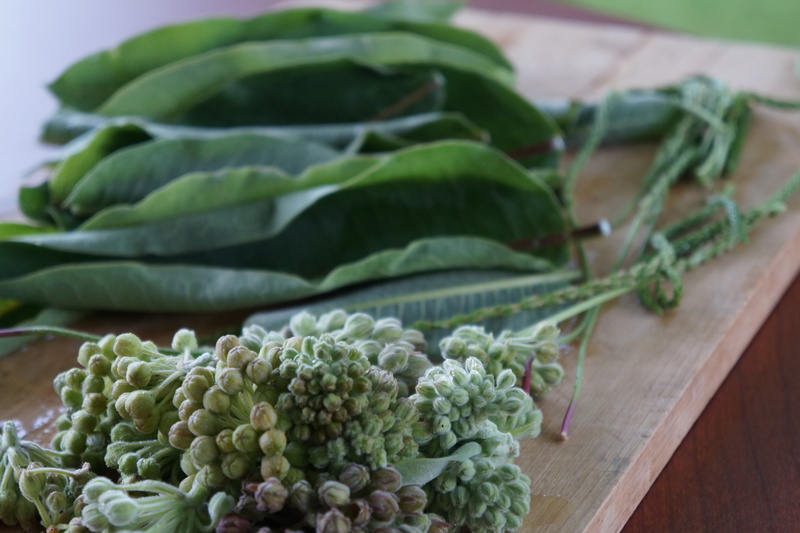 Once I tried this recipe for fetuccine made with the leaves and buds of milkweed I decided to bring it to Angie’s Fiesta Friday #23 and share it with any of my readers who have milkweed. And if you don’t have milkweed, broccoli leaves and flowers could be used in their stead. 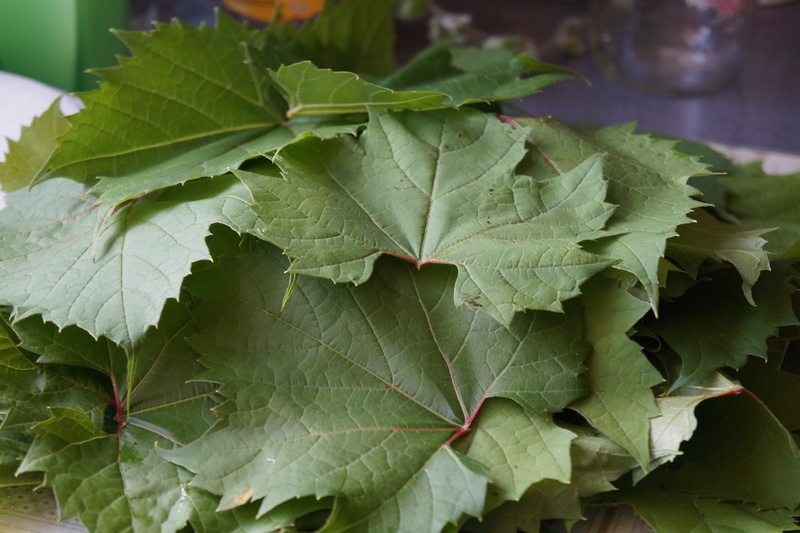 The Forager Chef creates some of the best and most innovative recipes using foraged ingredients I have found. The recipe in its original is here – and you might like to look through his blog to see some of his creations, especially those using a great selection of wild mushrooms. Two things made me want to try this recipe. 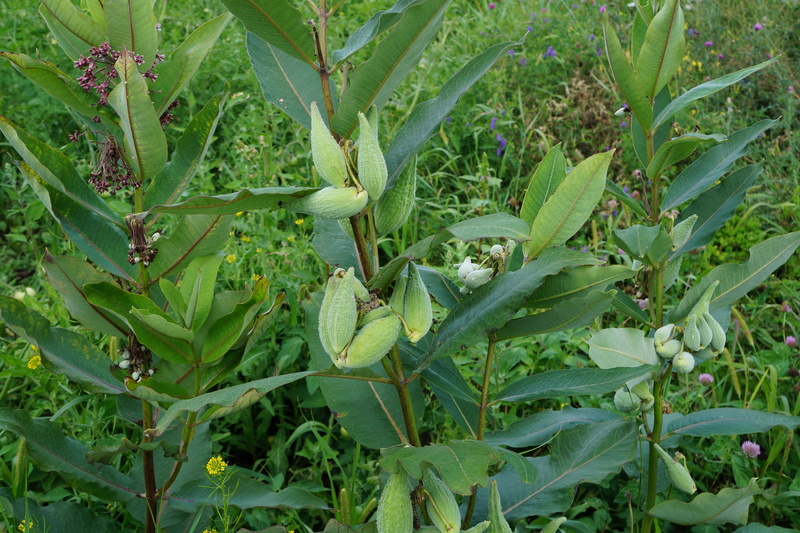 First, I have such an abundance of milkweed now as we have tried to encourage its growth for the sake of the monarchs, none of which has shown up yet. The other incentive was that I really like home-made pasta, especially when it is a recipe which is unusual enough that it is only available if you make it yourself. I made only minor changes in the recipe. I used lime instead of lemon, and cheddar cheese instead of parmesan. 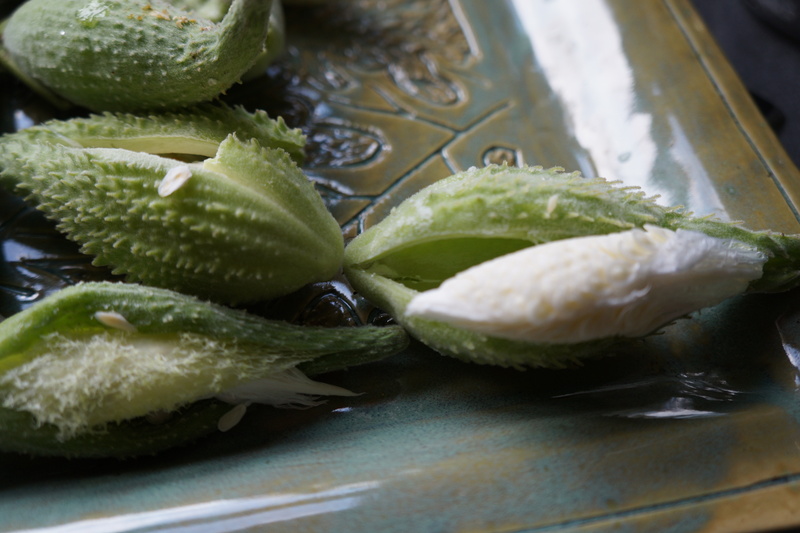 The milkweed has a delicate floral flavour, and the lime zest is a perfect pairing for it. The pasta was easy to work with, but having added just a tad too much water I dusted it liberally with semolina when rolling it and once it was cut. I blanched the leaves and flowers together along with a few plantain flowers I was using for something else, and used the stock from cooking these in the pasta and for the pasta sauce. 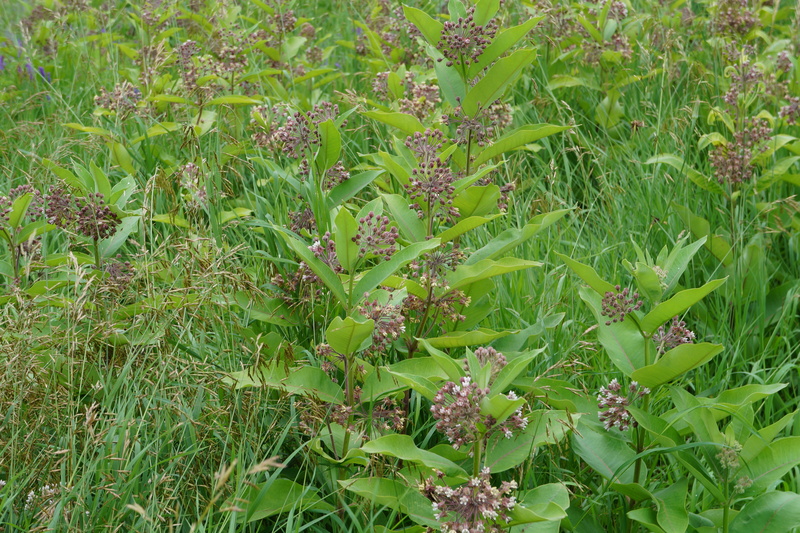 Categories: edible weeds, garden vegetable, main dish | Tags: common milkweed, fetuccine, Fiesta Friday, Forager Chef, foraging, milkweed flowers, milkweed leaves, Ontario, pasta dish, seasonal | Permalink.